This will be the cafe, designed by Caruso St John. • We promote the research, exchange and dissemination of ideas inspired by today’s art practices across disciplines and cultures, working with a wide range of partners. • We are committed to excellence, experimentation, ambition and innovation - in contemporary art and within our own organisation. • We work to attract new audiences to contemporary art through imaginative educational activities, our communications and our events. • We support the creative and critical empowerment of artists and audiences. Both groups play an active role in our organisation. • We give local people a stimulating cultural and social home, while attracting national and international visitors to the city. Nottingham Contemporary is a place where the world is imagined differently, and nicely complements the work I'm doing with Intermediæ. 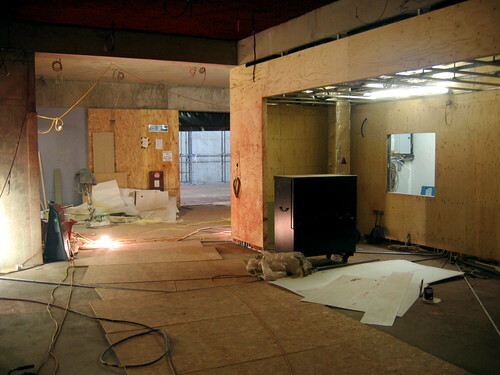 You can see how the building is developing, and join me at the opening on 13th November 2009.